Best Adaptive Re-use Project: This award is granted to the best adaptive reuse of a building that has outlived its former use. After 51 years, Miller’s Texaco in downtown Pontotoc sat vacant. Located on Main Street on an intersection of two busy roads, the property was purchased by Shane Crausby in August of 2007. Shane tackled the rehabilitation with the intensity of a pro, doing 95% of the work himself, working after hours, weekends, and every stolen moment he could to transform a common generic service station into a modern luxury apartment. Shane and his wife finally moved into Phase 1 of the apartment in October of 2010. Phase 2 will add a bedroom, bath, and lounging area. Shane also owns several other buildings in the downtown area that he has plans on rehabbing. He also finds time to serve on the Board of Directors for the Pontotoc County Chamber/Main Street. Best Façade Rehabilitation over $10,000: This award recognizes the best single façade renovation project over $10,000 that enhances the commercial district and encourages further design improvements. The City of Kosciusko purchased the Kosciusko Strand Theatre at 209 N. Madison Street just off the square in downtown Kosciusko for the Strand Arts Center and Museum. The scope of work included a complete restoration of the theater façade, roof replacement and structural repairs. Supported in part by funding from the Mississippi Legislature through the Mississippi Arts Commission, the city is actively pursuing further grant opportunities to complete the historic restoration of the theater. Mayor Jimmy Cockroft wanted the City to set an example of a historic approach to downtown building restoration and rehabilitation. Best Façade Rehabilitation under $10,000: This award recognizes the best single façade renovation project under $10,000 that enhances the commercial district and encourages further design improvements. Hidden behind a dilapidated, faded mansard roof, burglar bars and rotten wood for trim work stood the once locally famous Onje’s Bakery in Greenwood. Its owner, Mr. W.O. Thurgood, took advantage of Main Street Greenwood’s Carrollton/Johnson Revitalization Incentive Grant program to begin to restore the front of the building. Mr. Thurgood felt strongly that a façade grant would not only “benefit his business, but would also enhance the integrity of the entire business area.” Mr. Thurgood worked with local architect John Beard, local contractors and Main Street Greenwood to begin the façade rehabilitation, and today, Onje’s bakery is an icon of the restored, historic buildings in downtown Greenwood. Best Historic Rehabilitation Project: This award is presented to an individual or business that has completed an outstanding historic preservation project that maintains and enhances the use of the building in a downtown district. Situated in the heart of the National Register Historic District of Woodville, Woodville Lofts & Studios is the creation of James G. Derbes and Jan W. Katz, husband and wife, both originally from New Orleans, who fell in love with Woodville after Hurricane Katrina. They saw Woodville as an authentic Southern town with architectural and cultural roots dating from the 19th century. Woodville Lofts & Studios offers spacious, finely-detailed restorations - historically authentic, but with contemporary fixtures and flare – for living, working and enjoying - also adding a touch of the architecture of New Orleans’ French Quarter to this distinctive Southern community. Best New Signage: This award recognizes excellence in signage design, craftsmanship, creativity and overall impact on its building or entryway to the downtown. This project was the first Façade Grant awarded to a downtown business owner by Laurel Main Street and represents an excellent example of an exterior sign improvement to an existing building with a nod to its original use as a twin cinema. After purchasing the property at 550 Central Avenue in October 2011, owners Robby and Angie Scruggs sought out a design firm that would be sensitive to the feel of the historic downtown. LIVE Design Group in Birmingham, AL generated a modern take on the old marquee style sign that was an original trademark of the building. The aluminum and metal sign was constructed and installed locally by B & C Welding and Fabricating in Laurel. Best Public Improvement Project (TIE – 1 of 2): This award is given to the municipality or Main Street program that has designed and implemented attractive and sympathetic improvements to its downtown district. The Breezeway Project on the historic Square in Carthage took an abandoned alleyway (where a building once stood) from being an eyesore to an attractive park in the middle of town, including the building of a water feature and the replanting of the entire property with shrubs and flowers. Walls were painted, shrubs and flowers planted and a water feature was created in the center of the park, with all the work done by volunteer labor. Today the area, which previously was just a walk through, is used for small community gatherings such as Christmas Parties, Sippin’ Cider and the Square Affair and has become a place for family photos and serves as the perfect spot for lunch for the many people who work on the Courthouse Square. Best Public/Private Improvement Project: This award is given to the municipality or Main Street program that has designed and implemented attractive and sympathetic improvements for its downtown district utilizing both public and private partnerships and resources. The historic Carrollton/Johnson corridor is a key corridor for those entering the downtown area of Greenwood. However, the district had fallen into a state of great disrepair over the years until Main Street Greenwood made its revitalization a top priority. Main Street Greenwood began work in 2008 with a $250,000 grant from the Foundation for the Mid-South. An incentive grant program was established to allocate the money for exterior appearance improvement projects on buildings located within the district. For 4 years, Main Street Greenwood worked diligently with the Foundation for the Mid-South to locate and work with property owners to restore the façades of buildings located in this district. The Carrollton/Johnson District façade revitalization efforts of Main Street Greenwood have not only restored 22 building façades, but with 4 new businesses open and a linear park along the abandoned rail line, retail foot traffic has increased, serving as a spark to re-establish the vitality of this district. Best Public/Private Partnership Project: Recognizes creative and positive joint ventures between the local government and the private sector. The daily Meridian Area Farmers’ Market was founded in the 1980s by Meridian Main Street, with support from the Lauderdale County Extension Service and the City of Meridian. However, over the years, it became semi-autonomous and foundered, with no marketing and sporadic hours of operation, which frustrated fresh produce lovers. So, Meridian Main Street developed a plan to support the daily farmers’ market, expand merchandise to include homemade food products, and create a family-friendly, monthly festival called—Earth’s Bounty—Local, Fresher, Better –that married food, freshness and fun in six festivals in 2012. Earth’s Bounty was so successful that Meridian Main Street decided to expand it to seven festivals in 2013 and develop signature tote bags and T-shirts. After just one season, Earth’s Bounty is well on its way to becoming a beloved community tradition. Best Business Retention/Recruitment Program: Awarded to the downtown organization that has created and implemented the best retention and business recruitment program for its downtown. Main Street Clinton’s Economic Restructuring committee produced a business recruitment packet in 2012, after a branding and marketing charrette by Arnett Muldrow and Associates. The packet included a map of the Main Street Districts, demographics and major employers, an incentive sheet, available property listings, photos of available properties, a romance piece that described the downtown, and a note card for recruitment team members to leave a personal note for the business owner. The Economic Restructuring Committee has plans to add additional information to the recruitment packet based on some recently updated market research. An opportunities document will be added to highlight the top business opportunities based on retail leakage analysis, and the ER Committee will get busy searching for new businesses. Best New Development Project: Granted to an individual or business that has undertaken a new development project within a downtown district that not only achieves financial success and quality design but also has made a positive impact on downtown revitalization. Rue Vieux LLC was created in 2011 with 10 women investing $10,000 each to purchase properties within the Rue Magnolia & Water Street area of Biloxi, a great place to create an Arts District. Their first purchase was a 2-story apartment building. The outside was given all new paint and landscaping, and the front small apartment was turned into an Art Studio and Gallery. The next building purchased had been a toy train store for the past 10 years and was in dire need of repairs. This group received a $5,000 façade grant from Biloxi Main Street and added an additional $100,000+ of repairs to what is now called the Cousins House, which houses a café on one side and retail space on the other. Rue Vieux recruited a satellite branch of the MS Craft Center to move into a historical property that the City had moved and restored on Rue Magnolia. Creole Cottage was another historic property the City restored, which houses the Dusty Bonge’ Foundation. The Side Porch Gallery and Prima Donna Consignments came to be housed in the same building with a law office, also on Rue Magnolia. The latest two properties purchased are a bungalow on Rue Magnolia along with a house directly adjacent to the Cousins property. These projects could not have been completed without the leadership of 25 women and their dedication and drive to bring downtown Biloxi back to life. Main Street Merchant of the Year: This award recognizes excellence in the retail field and goes to a merchant who has been a “mover and a shaker” in downtown revitalization and exemplifies the best in merchandising, inventory, display, hours, quality, convenience and service. “The Batesville Square is Open for Business” has been Main Street Merchant Yvonne Taylor’s mantra since opening her first business in 2010. “Y. Taylor’s Gifts & Interiors” brought a new shopping experience to the town square and a devoted following of discriminating shoppers. She opened her second store in 2011, “The Veranda,” which carries clothes and shoes for today’s woman. The old bank building next door became the Sweet Shop filled with chocolates, ice cream, and sweets, and inside the old bank’s original vault is “The Barkery,” a retail information hub and support for the local Humane Society. Yvonne even found time to write a dog tale and donates her book sales to this group. The Batesville Square is open for business thanks to Yvonne’s commitment to serve, grow, and invest in downtown Batesville. Best Creative Fundraising Project: This award is granted to the downtown organization that has displayed the most creativity and success in securing funds for its downtown program or specific project. Club Whispers was an iconic night club set amidst the landscape of downtown Greenwood. The façade murals of brightly colored dancers, martini glasses and faces of R&B artists from years past welcomed people into downtown. Known as “the place where the grown folks play”, Club Whispers underwent a façade renovation as part of Main Street Greenwood’s Carrollton/Johnson revitalization efforts, and the panels were saved during construction. The idea came about to auction off the panels to festival-goers as art installations. Local artist, Ricky Ferguson, was hired to complete the unfinished panels, which were displayed in a silent auction during Greenwood’s Annual River to the Rails festival. Festival-goers bid on the 15 different panels for the chance to take home a piece of iconic, downtown Greenwood history, raising more than $800 for the Main Street Greenwood Façade Grant Fund to be used to restore future façades in downtown. Best Image or Branding Promotion: This award recognizes the downtown organization that has developed an effective public relations piece or promotional campaign that motivates the consumer and promotes community loyalty. Pontotoc is the “Best Place to Raise Kids in Mississippi,” thanks to a Bloomberg Business Review article published in November 2011. As a result, a project to re-open the City Lake for family recreation was born. Soil and Conservation Crew had the renovation plans ready and the timeline was completed. Fish were stocked in the Lake and by January 2012 the local city officials, soil conservation personnel and the fish hatchery gave the “go ahead” to prepare for the opening on Memorial Day Weekend. Best Culinary Arts Event: This award recognizes the downtown organization that has created a quality special event, emphasizing the food and culture of the local, creative economy. 2011 marked the inaugural year for the “Don’t Be Cruel Bar-B-Q Duel” fundraiser for the Link Center - a center for non-profit organizations in Tupelo. After two years in downtown Tupelo, the “Don’t Be Cruel Bar-B-Q Duel” is one of the most successful events held in Tupelo. 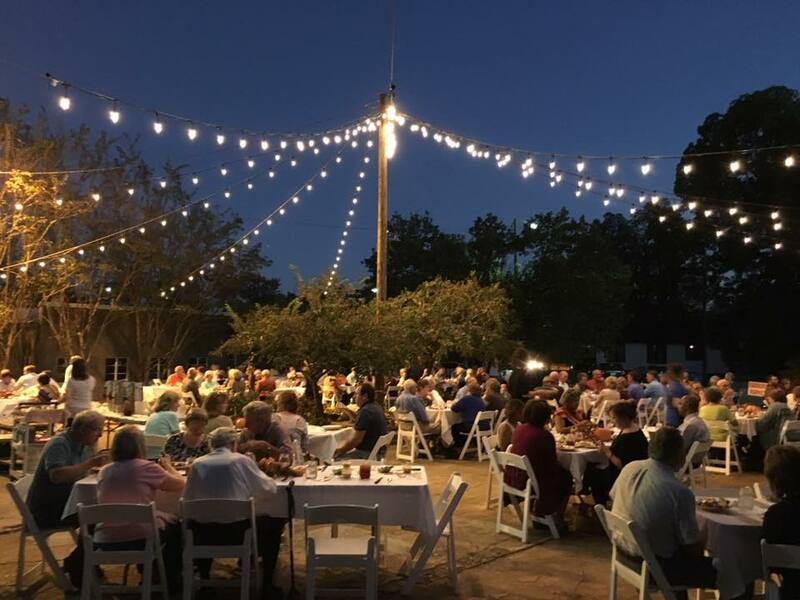 Joining the Kansas City Bar-B-Q network and moving the event to downtown Tupelo’s Fairpark District took it to the next level. The first success was attracting 82 teams to compete in Tupelo. The next was organizers being able to capture the attention of national television’s TLC Channel series, Bar-B-Q Pit Masters. Downtown Tupelo became the setting for the 2012 Season Opener of the popular TV series, creating quite a buzz locally, regionally and nationally for a huge tailgating, pit-smoking entertainment venue. The 2013 competition grew and registered 100 teams from all over the country. Best Newsletter – Population over 5,000: This award recognizes excellence in communication by a downtown organization through its print or online newsletter. The Canton Connections weekly email newsletter is distributed to more than 700 contacts, focusing on upcoming events, local shopping, news, community events, member-submitted items and general community information from the board and staff. Submissions come from members each week. An example of how the newsletter has been successful is the Mayoral Forum to inform Canton voters. A list of the candidates was compiled and included information on registering to vote, deadlines, and the mayoral forum. A link to a website in the newsletter allowed community members to submit questions for the mayoral candidates. Overall, the newsletter is one of Canton’s strongest internal marketing tools, having three main goals: locals buying local, news distribution, and community involvement. Best Downtown Directory: This award recognizes the downtown organization that has developed a creative promotional piece that serves as an effective downtown directory to visitors and tourists. Tunica Main Street’s Brochure is mailed to visitors and made available to tourists in every North Mississippi Visitor Center. Published by Tunica Main Street as a no-cost benefit to all the merchants, Tunica local businesses and local tourist attractions keep a supply on hand for all tourists. Photos on the brochure depict Tunica’s downtown area as well as a map and business directory of all the businesses on Main Street and the Highway 61 Corridor. An insert map shows Tunica’s location in regard to other cities, which is most helpful for traveling tourists. Best Retail Promotion: This award honors the downtown organization that has developed an effective retail promotion in conjunction with downtown merchants. Sip N’ Cider is held each year in December in conjunction with the Canton CVB’s Victorian Christmas Festival to draw visitors into the stores to generate sales. Participating merchants serve homemade cider recipes and are listed on a ballot. Over a thousand visitors each year must visit at least 6 shops to vote on their favorite cider, with each merchant providing door prizes to encourage visitors to provide contact information. That information is harvested to invite each visitor back to other promotional events. The winner receives the “Cidermeister” trophy which is displayed in the shop until the next year’s Sip N’ Cider. Best Special Event (TIE- 1 of 2): This award recognizes the downtown organization that has created a quality special event, generating traffic for the downtown. The Peter Anderson Arts & Crafts Festival makes a significant contribution to developing the Gulf Coast as a regional arts destination, which draws more than 120,000 to the local area for the 2-day event and thousands more during “festival season,” and provides an economic impact of more than $23 million to Ocean Springs, Jackson County and the Gulf Coast. The event includes a kick-off event three months prior, followed by pre-parties and entertainment leading up to the event held in November in downtown Ocean Springs. With more than 400 artists, craftsmen and food vendors, live music, demonstrations and more, the festival is now the largest fine arts festival in Mississippi. Vicksburg Main Street hosts the Bricks and Spokes Bike Ride in conjunction with its annual Fall Festival. The ride features a 10 mile, 30 mile, or 50 mile ride that begins downtown and travels South over the Old Mississippi River Bridge. Riders enjoy the views of the beautiful Mississippi River, Louisiana, and gorgeous downtown Vicksburg and Warren County. In just four years, the number of participants has grown tremendously to more than 200 riders and 30 volunteers. Bricks and Spokes is a great way to get families moving and help sustain historic Vicksburg and the wonderful businesses in its downtown area. Special Service Award – Private Sector: This award recognizes a citizen from the private sector who has contributed leadership and support for downtown and best represents commitment to the goal of revitalization. Aaron Akers has served Carthage Main Street with distinction since its inception in 2007 as a former board member and past chair of the Design Committee. An early partner in the revitalization efforts of the Courthouse Square, Aaron helped secure finances through a Mississippi Small Municipalities Grant and a grant from the Mississippi Department of Transportation. He has overseen the planting of green spaces and oftentimes taken the initiative to do the work outside of a normal work day. As Chairman of the Breezeway Project, he not only designed the park but also worked to obtain additional funding to complete it. The project took an abandoned alleyway from being an eyesore to being an attractive park in the middle of town, including the building of a water feature and the replanting of the entire property with shrubs and flowers. The Breezeway has now become a widely used area for small community gatherings and a place where people can take a break from their busy day. Aaron has also served as a key advisor to the City in its efforts to adopt a comprehensive plan for the city’s future growth. Special Service Award – Public Official (TIE – 1 of 2): This award recognizes an elected or public official who has contributed leadership and support for downtown and best represents commitment to the goal of revitalization. Mayor Steve Rosenthal has been Mayor of Indianola for four years, and during that time period he has demonstrated great leadership and support for downtown. He was a third generation downtown retailer until his store burned; thus, realizing first-hand the value and need for revitalization of the downtown. Mayor Rosenthal has a great working relationship with the current downtown merchants, as well as the merchants on Highway 82. Currently, Indianola Main Street and the City of Indianola are working on a huge "green space" project in the downtown area, and Mayor Rosenthal with others has been instrumental in obtaining more than $40,000 for the project. In addition, he has overseen the project from the beginning to the current stage. The Mayor serves on the Indianola Main Street Board and is a working Board member. He has participated in the "Truck or Treat" and "Lunch with Santa on the Bayou" events in downtown. He has served as Grand Marshall and volunteered to conduct registration every year for the "Delta Sole - 5K Walk/Run," which begins and ends at the BB King Museum. Mayor Rosenthal is active with the Delta Promise Community, which is housed in the downtown area. He serves as chair of the "Excel by 5" committee that promotes early education, health, recreation and resource development. Indianola Main Street and the Mayor have partnered on several grants that have benefitted the downtown area, including a grant through the Mississippi Tennis Association to resurface tennis courts. Through the Mississippi Development Authority, he gathered concerned citizens to conduct an "Asset Mapping" with an emphasis on the downtown area. Mayor Rosenthal represents the total and true commitment of Indianola Main Street’s goal to revitalize the downtown area. Mayor Jimmy Wallace has definitely left his mark on the Carthage community since being elected in 2006. Under Mayor Wallace’s tenure, the City has seen marked improvements in its quality of life and revitalization of the downtown area. He, along with the Board of Aldermen, passed the City’s first historical preservation ordinance in 2008 to set up the formation of a Historical Preservation Commission and allow the City to become a Certified Local Government. Through this framework, the downtown Carthage area was placed on the National Register of Historic Places in 2012. Also in 2012, under the Mayor’s leadership, the City embarked on a massive paving program that paved 95% of the streets throughout Carthage, a project done by the City instead of contracting it out, which saved thousands of taxpayer dollars. The City has also seen a major effort to replace its entire system of street signs at major thoroughfares. Mayor Wallace has initiated two projects that are ongoing, and will positively impact the future of the City. City government has taken on the process of rezoning the entire community and putting in place a comprehensive plan for future growth. In addition, the City has embarked on a $700,000 renovation project for the downtown area. The Comprehensive plan has taken steps to plan for the future growth of Carthage. Phase One of the Square Renovation project was completed in late 2012 and has added new pedestrian-friendly sidewalks and lighting. At the cost of $200,000, this plan also provided for green space throughout the area. The remainder of the Courthouse Square will be completed by the end of 2013. Mayor Wallace’s leadership and efforts have spurred ongoing development and quality of life for the entire Carthage community, centered on the historic Square. Spirit of Main Street Award: This award recognizes an individual or group in a community who has displayed an involved commitment to downtown. The “Making a Difference on Main Street” program in Clinton brings attention to businesses that are doing their part to further the Main Street cause in a variety of things from façade improvements and excellent customer service to the number of years in service to the community. Committee members submit nominations and the winning business is presented a certificate to hang in their business, a counter sign and a sandwich board sign to display outside the business. An article is placed in the local paper highlighting the reasons for the award selection. Since the implementation of the program, the committee has been pleased to recognize a number of winners. Main Street Clinton views this program as an important tool in their revitalization efforts that, in its own way, is “Making a Difference”. CHARLES O. BEASLEY AWARD: Charlie Beasley was one of the founding members of MMSA and served on the Board and in various officer positions, including President. He was Board Member Emeritus at the time of his death in 2007 and had served Main Street since its inception in 1989. This award is a $1,500 scholarship to attend the National Main Streets Conference, given to a Main Street Manager who has shown outstanding service to his or her community and Main Street program. The scholarship is awarded annually and nominations come from the MMSA District Directors. With more than 25 years of experience in marketing, tourism and Main Street, Margaret Miller has been leading the efforts of the Ocean Springs Chamber of Commerce – Main Street – Tourism Bureau since the beginning of its Main Street inception. A transplant from Indiana, Margaret handpicked Ocean Springs as her home nearly 30 years ago. She is a graduate of Indiana University and has been married to Gregory Miller, her high school sweetheart for more than 40 years, who is here with her today. They have five children, all of who remain close to home here on the Mississippi Gulf Coast and five (soon to be six) grandchildren. Margaret’s background and experience is substantial. She is a charter member of the Mississippi Gulf Coast Land Trust, Lynn Meadows Discovery Center, the Public Arts Project of Ocean Springs and the Governor’s MSGoCoast 2020 committee; co-founder of Leadership Jackson County and served on the board of numerous entities, including: South Coast USA, Mississippi Main Street Association, Gulf of Mexico Foundation, Mississippi Tourism Association, Mississippi Development Authority, Southeast Tourism Society and the Mississippi Gulf Coast Land Trust, just to name a few. Margaret is also the recipient of numerous honors and awards including the Governor’s Conference on Tourism, Research in Action, Outstanding Leadership, and the 2013 Great American Main Street Award. Margaret has a love and passion for Ocean Springs, the Mississippi Gulf Coast and the state of Mississippi that is reflected by the growth and development the Ocean Springs community has seen over the past 25 years. Congratulations to Margaret Miller, 2014 Charles Beasley Scholarship Award recipient and our Outstanding Manager of the Year!